A maamar means something said, from the word amar, which means “to say.” But in Chabad, a maamar is no ordinary statement. The saying of a maamar carries unique significance. In fact, it is in delivering an original maamar to his chassidim that the role of a rebbe is most essentially epitomized. Chassidim stand when a rebbe says a maamar, because they understand that he is drawing a new light into the world, a new vision for each of them as individuals and for the world as a whole. For generations to come they will study the maamar carefully, striving to comprehend it as much as possible, to repeat it and explain it in their own words, to integrate it into their worldview and into the way they live, and to illuminate all reality with its vision. But what makes a maamar so unique? What are its characteristics? How is it to be approached, understood and applied? Most people who know about Chabad know that there are teachings that we refer to as maamarim, but most don’t understand exactly what a maamar is. Do maamarim have a common purpose that sets them apart from other forms of teaching? What makes them different than other forms of rabbinic discourse? Eli Rubin: First and foremost a maamar is an inspired and uniquely authoritative teaching delivered by a chassidic rebbe to his disciples. I say delivered because in the world of Chabad a maamar is not viewed as a personal composition, as a product of the Rebbe’s own mind, but as a visionary revelation from on high. This is also why I used the word authoritative. The Talmud records that a heavenly voice once proclaimed that the opinions of the schools of Hillel and Shammai are both divrei Elokim chayim: “words of the living G‑d” (Eruvin 13b). In Chabad this designation (or the acronym dach) is applied to the rebbe’s delivery of a maamar: The rebbe is the conduit through which G‑d’s word flows. And the ultimate purpose of these teachings is to make G‑d’s most intimate thoughts openly accessible to everyone. In the Tanya, the foundational work of Chabad Chassidism, R. Schneur Zalman of Liadi wrote that in each generation there are “wise men, the visionaries of the community,” and that their role is to teach the people knowledge of G‑d so that they may serve G‑d with a complete heart (Tanya, chapter 42). In Chabad, the delivery of a maamar is not seen as just another commentary, another interpretation of the Torah. The delivery of an original maamar is the quintessential embodiment of all that it means to be a Chabad rebbe. It is the moment when the Moses of our time transmits an authoritative communication of divine wisdom which is uniquely relevant to our generation. The weighty significance of such an occasion was palpable. Before a maamar was delivered, the gathered chassidim would sing a solemn, stirring melody and rise to their feet, preparing themselves spiritually and cognitively for a new influx of divine revelation. 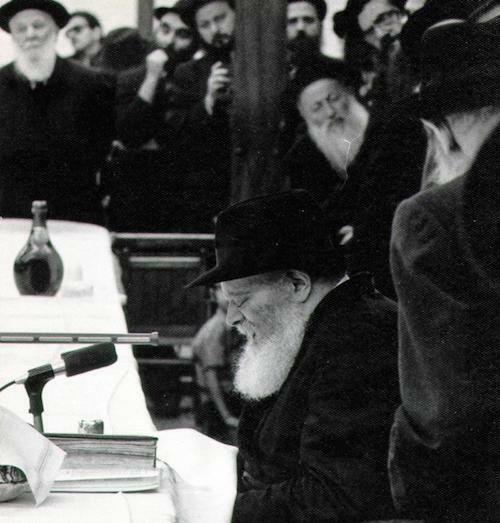 Whenever the Rebbe spoke in public, his tone and bearing were usually animated, his eyes open and alert. But when he delivered a maamar, his eyes were closed and his bearing took on an aura of motionless submission, as though the Rebbe was himself soaking up the words issuing in a soft sing-song from his mouth. Tzvi Freeman: Since we’re talking within the context of Chabad, before we can understand what a maamar is, we have to discuss what Chabad is about. Chabad is an approach to the central teaching of the chassidic movement: that every Jew can serve G‑d with love and joy. Rabbi Schneur Zalman of Liadi realized that you can’t love something you’ve never thought about, and that includes loving G‑d. But that creates a problem, because when it comes to G‑d, as the Zohar says, “no thought can grasp Him at all.” So the task then became, You can’t love something you’ve never thought about, and that includes loving G‑d.how do you think about a G‑d that cannot be understood? Eli deals with much of this in his essay. I would add that part of the solution is the use of metaphor from the human psyche. Love, wisdom, desire, creativity, etc.—these are also things of which we have no real understanding. Yet we experience them firsthand, so it’s possible for us to ponder them. By borrowing them as metaphors for G‑d’s act of creation and His relationship to us, Rabbi Schneur Zalman rendered G‑d ponderable without compromising any of the mystery, awe and wonder. Another part of the solution is the maamar. The maamar may be called a guided meditation, but one that really taxes the mind, immersing it deeper and yet deeper into the mysteries of the Torah, the soul, existence, the divine energy that sustains existence, and the Creator Himself. It’s not enough to study a maamar many times over in depth, critically and analytically. That’s only the beginning. The real point is to think it through for extended periods of time, especially before morning prayers. That’s when it truly becomes a maamar. But, as I said, the maamar is a means of applying your mind to a G‑d whom your mind cannot contain. That’s a precarious balancing act. On the one hand, you have to put aside your own perceptions and preconceptions and stick to understanding, “What is the maamar saying?” On the other hand, it’s crucial that you engage every facet of your mind, including all the creativity you can muster, in If you give it everything you’ve got, a maamar lifts you up and out of the mundane into a more inspired form of living. attempting to bring its message closer to your own personal understanding, to make it more tangible and real. The goal of all this meditation is a kind of cognitive reframing—you end up seeing the world differently and feeling differently about it. If you give it everything you’ve got, a maamar lifts you up and out of the mundane into a more inspired form of living. Your times of prayer and Torah study come alive, and you feel a greater joy in your mitzvahs. You begin to live in a whole different world—the world of the maamar. What does the world of the maamar look like? Is there a common structure and content? Eli: Over the generations, each of the rebbes developed his own style and built on the teachings of his predecessors. But there are some axiomatic characteristics that carry through all the way. The first, as I mentioned above, is the visionary authority that maamarim carry. The second is the theme of unity: the unity of G‑d, the unity of the Torah, the unity of the Jewish people, and ultimately the unity of all things. At the outset, a maamar is usually presented as a commentary to a verse from the Tanach, or to a statement made by the Talmudic sages. Yet the purpose of the maamar is not to decipher the literal meaning of the source, but rather to creatively unearth and reveal new meaning, relevance, insight and inspiration. In a similar way, a maamar will usually invoke and explain Kabbalistic motifs and concepts, drawing on the Zohar and on the teachings of the Arizal. Yet the purpose of such invocations is not to offer scholarly interpretations of esoteric ideas, Each of the rebbes developed his own style . . . But there are some axiomatic characteristics that carry through all the way. but rather to teach us how to apply these ideas in our own service of G‑d. As I argue in an article I wrote, the general characteristics of a chassidic maamar revive the style and orientation exhibited in Midrashic texts, which are the original wellspring from which all streams of Jewish thought and mysticism flow. The hallmark of both Midrash and the maamar is a sense of axiomatic faith, a sense that is both intimate and elusive, and which can be expressed only through the kind of open-minded wonder that draws on all the cognitive and imaginative avenues of the human mind and heart. Tzvi: Understanding the structure of a maamar helps in understanding the maamar itself. A sense of the maamar’s structure is important, because if the maamar doesn’t flow naturally for you, it means you’re not getting what it’s trying to say. That’s one of the things the Rebbe taught us about maamarim—the structure is as important as the content. Maamarim are also very concerned with legacy. Almost every later maamar can, in some respect, be traced back to a maamar of Rabbi Schneur Zalman. With the Rebbe’s maamarim in particular, it’s crucial to understand that they are actually a superstratum above many layers of maamarim beforehand. Most of the Rebbe’s maamarim are framed as an analysis of a maamar of one of his predecessors. That makes them harder to study, but allows the Rebbe to introduce some quite radical concepts while keeping them grounded on a solid foundation. It’s also important to point out that the topic of the maamar is rarely what it appears to be. It may appear to be homiletical—as though the topic were concerned with how to interpret some scriptural nuance. Or it may seem to be a question on the season of the year. But the real subject is always breathing just beneath the surface. What you’re seeing is just the clothing. We use the term clothing and not packaging, because if it were just packaging, we would throw it out and get to what’s inside. It’s clothing, because it provides a means for you to perceive and grasp concepts that would otherwise defy perception. And as good clothing should, it brings out the beauty of the subject it clothes. Nevertheless, your real interest is not the clothing—it’s the subject. And that is always the same: G‑d in His relationship to us. Are there unique characteristics to the Rebbe’s maamarim that set them apart from those of his predecessors? but are often presented as direct commentaries to an earlier maamar. The Rebbe will closely analyze the structure of the earlier maamar, the questions, the explanations and the answers, what is said—and, even more importantly, what is unsaid. In this way the Rebbe will uncover a series of questions and extrapolations, slowly excavating an entirely new avenue of thought. I would add that the precision with which the Rebbe creatively analyzes earlier texts—a method that he extends to the likes of Rashi and Rambam, as well as to the writings of earlier Chabad rebbes—is itself an exercise in the demonstration The Rebbe’s most breathtaking insights are usually slipped in, almost as asides, sometime even as footnotes . . .of the essential unity and absolute relevance of every aspect of Torah. As I mentioned earlier, relevance is a central characteristic of every maamar. But I believe that the contemporary relevance of the Rebbe’s maamarim is particularly striking and particularly broad. The twentieth century saw tremendous political, philosophical, social and scientific upheaval. In his analysis of earlier maamarim, the Rebbe achieved two things. On the one hand, he illuminated the ideas inherited from previous generations and demonstrated their continued relevance in the modern era. At the same time he uncovered radically new insights, striking to the core of contemporary concerns about the chosen status of the Jewish people, about free will, rationalism and faith, about the nature of G‑d and about the place of religion in modern society. The Rebbe never says, “This is a huge issue, and here’s my radical solution.” His most breathtaking insights are usually slipped in, almost as asides, sometime even as footnotes, to an involved discussion of what otherwise seems a not overly consequential clause in a maamar delivered by his father-in-law. But if you read his maamarim with just a small fraction of the attention that the Rebbe applied to those of his predecessors, it becomes impossible to underestimate the broad relevance of his teachings, not only to Jews, but to everyone in this global society. the Rebbe’s thoughts in English to an audience not necessarily familiar with their context. Although I’ve been studying and When the world changes and new ways of thinking arise, a rebbe reaches deeper into that essence-point, and from there draws new light.teaching the maamar for decades now, I began to realize that I myself was lacking a grasp of some of the core concepts. It wasn’t until I realized I needed two words—subjective and objective—that everything began to fit together. Now that’s interesting: How is it that translating the maamar in some ways helped me understand it better than when I studied the original? The Rebbe didn’t prepare this as a treatise on contemporary thought. There’s no mention of any secular thinkers or their ideas—even though we can see from his letters and private interviews that he was certainly familiar with them. The Rebbe said a maamar—“words of the living G‑d,” as Eli explained. Something beyond now and then, modern and ancient. And yet, it turns out to be of burning relevance to contemporary issues. It’s speaking to us. And in the process of translation, those connections to contemporary thought force their way to the surface. The only way I can explain this is by invoking a concept the Rebbe himself once elucidated at great length: that the idea of Chassidut is to reach to the essence-point of everything. A point that has no dimension or form, and therefore can be expressed in any form—esoteric or pragmatic, complex or simple, timeless or timely. So, when the world changes and new ways of thinking arise, a rebbe reaches deeper into that essence-point, and from there draws new light. So you scratch your head and realize that what just slipped by resolves major issues with which phenomenologists, existentialists or postmodern thinkers have struggled—and then you notice a brief footnote pointing to a line in a maamar of an earlier rebbe, You have to stick to what the maamar is saying, without adding or detracting, but the delivery should be addressed to the audience.or even a Talmudic passage, that provides a solid foundation for all that was just said. Every maamar is packed with an extraordinary amount of information that requires a great deal of prior knowledge in both exoteric and esoteric Torah teachings. How can the beginning or intermediate student overcome this barrier to complete understanding? Tzvi: Obviously, a good teacher helps. We have a few video classes on maamarim on our site. A learning partner is also vital. Aside from that, there’s always something in any maamar for you, even if you don’t have that prior knowledge. And there were certain You have to ask all the questions—and there are lots of them.years when the Rebbe delivered much easier maamarim. But if you really want to get to “what is a rebbe?” you’ll need to work your way through at least some of the maamarim. You have to ask all the questions—and there are lots of them. You have to find time to think them through, to try to explain the ideas to others, and to learn to express those ideas in your own words, using examples from your own world. And you have to be ready to surrender to the fact that at the end of the day, some things need to remain unresolved. As the Rebbe himself once described the process, it’s something like baking challah. You tear off a piece and say, “This we’re not eating,” and only then can you bake the rest and eat it. Passover is approaching, and we’ll all be talking about the Four Sons at our Seder tables. The wise child in particular is the focus of the maamar that Tzvi translated, and is a key part of Eli’s article. Are there some insights from the maamar that you’d like give us a preview of? Eli: A central subtext of this maamar is a critique and reconstruction of the attempt to justify religion from rational and psychological perspectives. One of the particular features of modernity is our awareness of historical and cultural contexts, and of how these changing contexts impact the way we see the world. In the modern era there is a tendency to dismiss old ideas as anachronistic, and to treat the very notion that we can attain true knowledge with suspicion. Modernity forces us to confront the history of ideas and to reconsider that history in the light of more recent discoveries and advances. A central subtext of this maamar is a critique and reconstruction of the attempt to justify religion from rational and psychological perspectives.The landscape of modernity is strewn with question marks that cast long and threatening shadows in the direction of religion in particular. In this maamar, the Rebbe puts a devastating question in the mouth of the wise son. Yet the question is asked from a perspective of deep faith rather than from a place of skepticism. Drawing on the belief that the essence of divine being must transcend any humanly conceivable ideal, the wise son’s question places the entire tradition of Jewish thought in jeopardy. The details are beyond the scope of my comments here, and are explicated in the article I referred to earlier. But the Rebbe ultimately turns the very question itself into the ground of a sweeping new vision. Looking both backwards and forwards, he reintegrates the historically divergent streams of Jewish thought with their Midrashic source and rehabilitates them for posterity. Tzvi: There are many facets to this maamar, and I tried to avoid going in one direction or the other in the foreword. For example, when you sit at the Seder, is the main thing to follow all the rules and do it right, or to have an uplifting, spiritual experience? When you light candles before Shabbat, is the main thing the How, What and Where, or is it the mood and mental focus? The Rebbe is saying that it’s vital to have both. But even beyond that, he’s saying that the spiritual, subjective experience is not real unless it’s tied to that commitment to do it right—to follow the halachah to the letter. Because that commitment is where you put yourself aside and let G‑d in. For Tzvi Freeman’s translation and overview of the maamar “When Your Child Will Ask,” click here. To read Eli Rubin’s article “Intimacy in the Place of Otherness: How rationalism and mysticism collaboratively communicate the Midrashic core of cosmic purpose,” click here. A growing collection of essays on motifs of Chabad thought as they relate to today's world.